We understand how busy you are, so we have developed a sophisticated support system for you at each stage – applicant, participant, and alumnus. 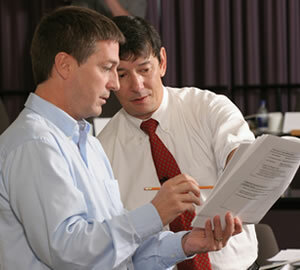 Our experienced team works very hard to ensure that your MBA experience is nothing short of exceptional. We’re here to support you every step of the way. From your very first contact, an Application Advisor will be there to answer all of your questions, provide preliminary feedback and assist you through every step of the application process. Your Application Advisor will work with you to ensure that your application is not only complete, but presents you and your qualifications in the best possible light. Additionally, our dedicated staff work behind the scenes to ensure your time can be devoted to learning. Case studies, textbooks and professor’s notes are always available before class. Additionally, course notes are posted on the program portal. You will have full access to the Queen’s University and Cornell University libraries, and any books that you request will be sent directly to you. All videoconference classes are recorded and streamed from our program portal, should you have to miss a class or wish to review one. Program Managers are available to handle issues that may arise during the program. Faculty members are available outside of class by telephone and e-mail. You will find them very responsive and committed to your academic success. During the residential sessions you have an opportunity to take part in various team and individual activities, participate in an individual fitness consultation and learn how to live a healthy, balanced life. You will also have access to a personal trainer who will work with you to design a personalized fitness plan. Throughout the program, Fit to Lead™ will continue to inspire you. Group challenges, newsletters and the lifestyle planner will help keep you involved. Your relationship with Queen’s and Cornell does not end with graduation. It is a lifelong relationship with a strong support system from both schools. As a full-fledged member of the alumni of both Smith School of Business and The Johnson Graduate School of Management, you will be afforded many opportunities to keep in touch.